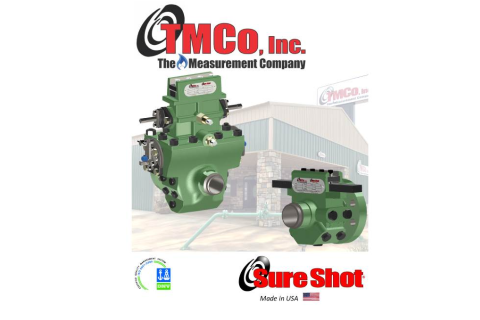 TMCo, Inc. is an Oklahoma corporation specializing in the manufacture of orifice fittings for the measurement of natural gas. The company was founded in September 2003 and has manufacturing facilities in Wewoka, Oklahoma; fabrication facilities in Simonton, Texas; and sales and administrative offices in Houston, Texas. TMCo has a worldwide network of sales representatives. TMCo is ISO 2001 certified, and our products are CRN approved and conformed to all applicable industry standards. Made in the USA. Our current product line consists of the SURE SHOT® Dual Chamber orifice fitting in 2”, 3”, 4”, 6”, 8”, 10”, 12”, 16” sizes and SURE SHOT® Single Chamber orifice fitting in 2”, 3”, 4” and 6” sizes and are available in 150, 300 and 600 ANSI ratings. Compared to other orifice fittings on the market, the “Sure-Shot” is simpler, safer and more economical to operate. The SURE SHOT® orifice fitting design meets or exceeds the guideline specifications, under the AGA3/API 14.3 & ISO 5167 standards for manufacturing custody transfer differential products for both the domestic and international market. In addition, we fabricate meter tubes consisting of an orifice fitting, upstream and downstream pipe sections, and flow conditioners. TMCo Inc. has over 120,000 Sure Shot Dual, and Single Chamber Orifice Fittings installed worldwide.